The Millennial mobile ad network keeps track of the number of ads-or impressions-that were viewed on each device and OS. While not a perfect way to measure popularity among operating systems and devices, it does provide a quick and dirty look at which devices and firmware are being used to read these ads. When looked at in this regard, the numbers do provide some sort of usage statistics. 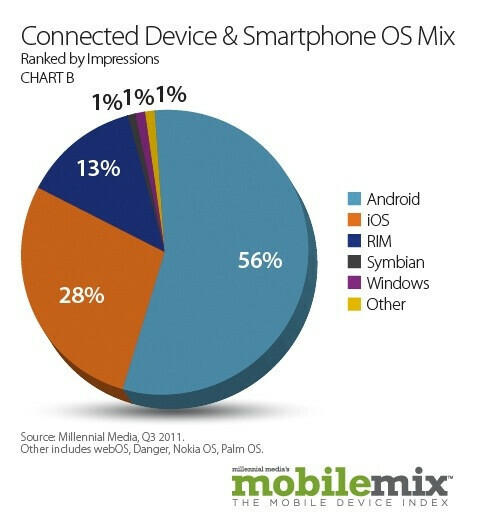 Based on the quarter that ended last month, Android devices had twice the number of impressions as iOS devices. Now we can't go ahead and say that means Android users outnumber iOS users by 2:1 globally, but it does give us an idea of which platform is in the hands of most smartphone users that received Millennial's mobile ads during the three months ended in September. 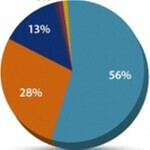 RIM was third with a 13% slice of the impression pie. Symbian came in with 1% while the combination of Windows Phone and Windows Mobile (there are still some older models using the latter) also accounted for 1%. Thanks to a very strong jump in impressions for the Apple iPad (456% gain in impressions year-over-year), Apple was the manufacturer with the highest number of Q3 impressions, holding a 23.09% share. Samsung was second with 16.485 followed by HTC's 15.5% slice. RIM and Motorola rounded out the top 5 at 11.05% and 10.70% respectively. Other names of interest include LG (6th, 9.14%). Nokia (8th, 2.41%) and Sony (15th, .2%). 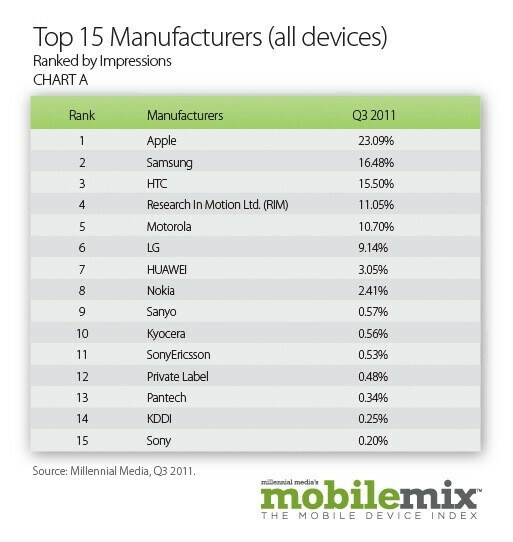 The Apple iPhone was at the top of the smartphone list with 12.55% of all impressions during the third quarter, followed by the LG Optimus series at 6.30%. Third was all models of the BlackBerry Curve at 4.70% with the Motorola DROID line right behind, accounting for 4.35% of impressions on the network. The HTC Desire came in fifth with a 4.01% share. Looking at impression share from one mobile ad network can lead to some strange stats. 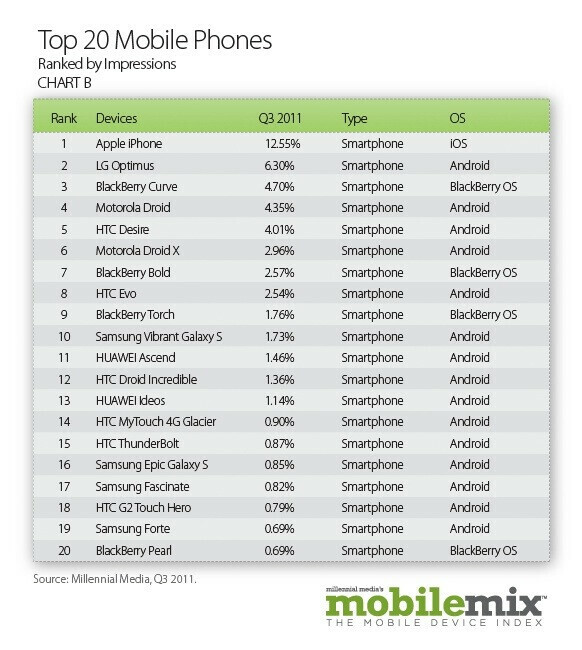 Huawei had two models (Ascend and Ideos) in the top 20 and the BlackBerry Pearl was number 20. No, it is not a popularity contest which makes the numbers more interesting because it is a referendum on the actual usage of mobile devices. oh, now i see why, they did that whole "break down by carrier" thing for the SGS even though they didnt do it for the blackberrys, iphones, or even the optimus devices. grr... consistency people..
that is just one carrier version the fascinate, SGS1, vibrant, and captivate are all stock SGS1 phones and should be under 1 heading like the iphone, curve, and LG are. The epic is an SGS1 with a keyboard, so that should be separate. And I bet all of them were either a Sanyo Zio or comparable to a Sanyo Zio. Considering how most of his arguments are "android are force close rofl"
I'm curious if "in-app" ads count... if they do this is almost useless because iOS has almost no ads in their apps and Android has apps in almost every free app. If they do not count then this is impressive for Android. Very inaccurate survey as lots of Android users root their phone and update their hosts file to block ads, or get a ROM that includes the updated hosts file.